Regular readers of the blog may know that I have a group of friends to whom I refer affectionately as “FBM” (first rule of FBM: never tell anyone what FBM stands for). We like to eat, and we like each other, so whenever we get together, there’s sure to be food involved. This time, KC went to Carmine’s a month or so ago and mentioned how great it was for big groups… so eventually, dinner was planned and there we found ourselves in the heart of tourist country. 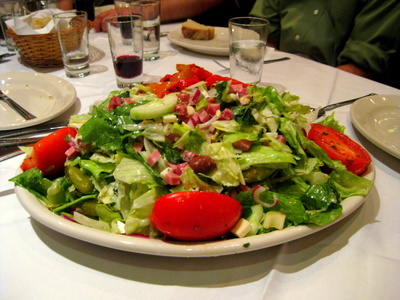 At KC’s suggestion, we started with the Carmine’s salad. We’ve all been known to take turns mocking each other for salad offerings – “You don’t win friends with salad” as the saying goes – but she made it sound so good that we couldn’t say no. And when it arrived, I was very glad we ordered this. There was a lot going on – basically a chopped up antipasto platter, with bits of meats, cheeses, olives, tomato, and plain iceberg lettuce, dressed lightly. I would have finished the whole platter if they’d let me! This is how salad should be 😉 Although I’d rather have Romaine lettuce but heck whatever, it tasted really good. Trying to show scale as to how big the appetizers were, I put my hand in the photo. 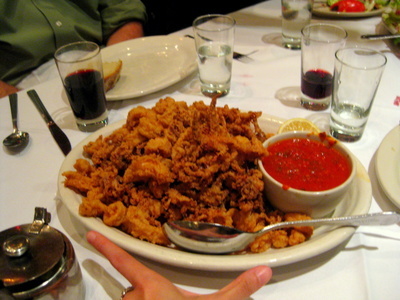 Fried calamari was up next; I thought this was OK. Not bad by any means, but very standard, nothing above average. Good to munch on, but not a must-order. Baked clams made their appearance next; I only had one and it was fine, again, nothing special. My baked clams are better. Hahaha, maybe because a piece of bacon graces the top of each baked clam I make, but regardless, these were just okay. 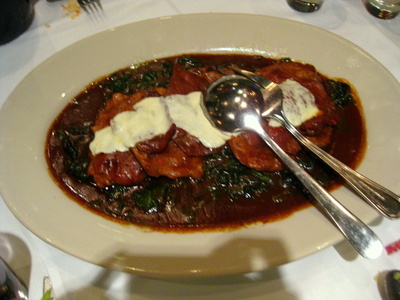 Veal saltimbocca – this was not good. The veal was thin, super tough, and did not taste like veal at all. I would definitely not order this again. 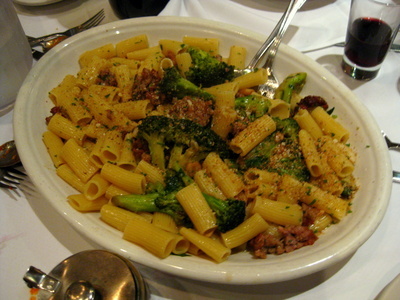 Rigatoni with broccoli and sausage. My plate with a little bit of everything on it. The chicken was pretty good for parmagiana, but I rarely ever order that so I have no point of comparison. The pastas were properly cooked, which surprised and impressed me (I’m pretty sure they don’t make the pasta from scratch here)… the red sauce was fairly standard, nothing mind boggling, while the broccoli/sausage combo was just OK, but that’s not a pasta dish I prefer in general. I was pretty stuffed from all the food on the table, though, and while we made a valiant effort in finishing things, there were a few things with a few bites left on the table. The food was good… but not amazing. 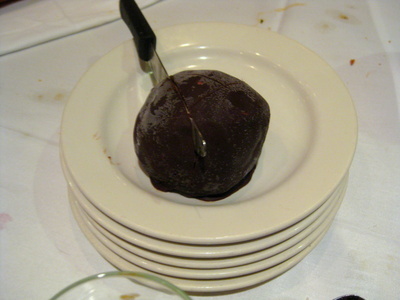 Our resident sweet tooth, TC, wanted dessert and ordered a tartufo. He kindly cut it open for me to photograph the center, and then gave me some to try. I even got to eat the cherry inside! What surprised me was the cherry tasted like it’d been soaked in almond extract or liqueur. Yum! Yvo says: This is definitely the place to feed a big group of people (who have mostly the same tastes in food, or who can come to an agreement on what to order) quickly! The price for everything above, with two bottles of house wine (which Beer Boor mentioned was the double-size? ), split among 9 people came to about $40 a person. Not too bad! I don’t know that I’ll be in a rush to go back, but I can comfortably suggest it for a large group pre-theater dinner in the future. Yup, there’s a magnum of… chianti? sangiovese? on the menu at $42 or so. As a magnum is 1.5 liters, it’s twice the size of a normal bottle, and a steal at a place like Carmine’s. So we enjoyed four bottles among nine of us (I think we all drank). 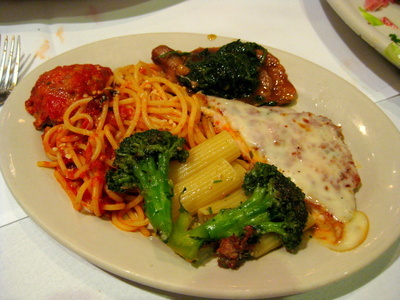 I liked the sauce in the saltimbocca, as well as the buttery clam sauce. But I could seriously eat that salad again all by itself, too. Surprisingly good with those thickly-diced Italian cold cuts. I wonder if I can sit at the bar and just wolf that down. With some spaghetti and meatballs. And a magnum of wine…. The saltimbocca, which I KNOW is supposed to be salty, was just too salty for me, and the veal was super chewy/tough. I gave away half of mine to TC. And yes, the salad was awesome. I want to try to recreate that… maybe for next potluck? Or you might just find me sitting next to you at the bar with my own salad. Pass on the meatballs. Maybe steal some of your wine too. Glutton. I liked the veal with spinach too. And for 42 bucks a head, it was totally worth trying Carmines. It’s not the best Italian food in the world but it is solid and feeds a large group well. That being said, I don’t think I like the food enough to go with only 1 other person (my original plan) which would result in me taking a ton of food home. Best to save it only for large groups so you basically can eat what you order there while it’s fresh. It was a good meal that night. I’d go back for another group occasion. 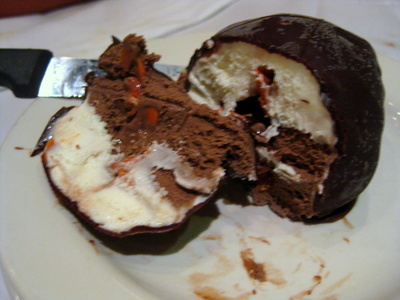 I so wish their tartufo was family style portioned too. If only. Yeah, I was kinda sad when the waitress told us that that it was small. I was hoping for an ice cream helmet or something. We should’ve ordered the TITANIC! I didn’t get a clear taste because I was half comatose by the end of the meal but I remember thinking they used legitimate maraschino cherries, which are soaked in Maraschino liqueur, which gets that almond-like flavor from the crushed cherry pits. I liked the greens in the veal dish. It soaked up a lot of the flavor without being overly salty. 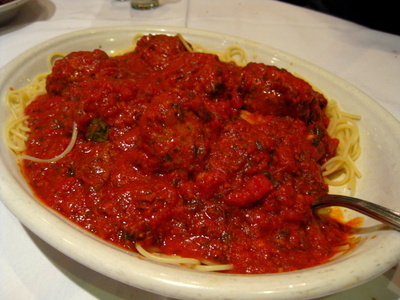 Otherwise I think I liked the meatball and spaghetti the most. A classic! 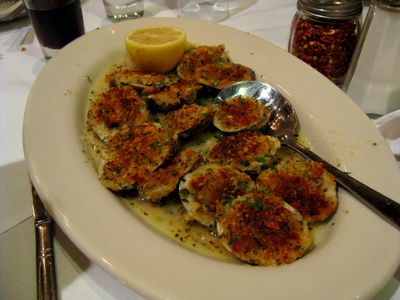 The salad, the baked clams…my fav. I never eat chicken parm out, but this one was pretty dope. Crunchy…so you know it was freshly fried…. 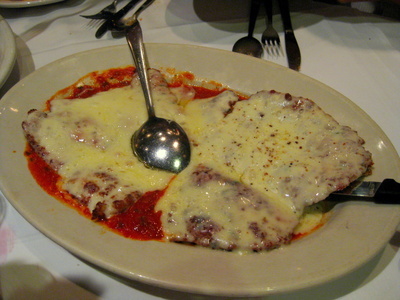 I can only imagine if Carmine’s didn’t make fresh chicken parm. Ugh. Well, since it is also near Times Sq., they should give Famous Famiglia a run for their money. Trumped! Tourists wouldn’t really give a crap. I guess it really is like Fight Club…….